Within the financial success model, we can allocate time to either leadership activities or management activities. The way this allocation is handled determines the balance you create in your life. Take a moment to look over the Green-Blue-Red Balance model. An exercise in determining your financial and life balance. Use a typical week or month for you and consider what percentage of your time you invest in green, blue and red activities. 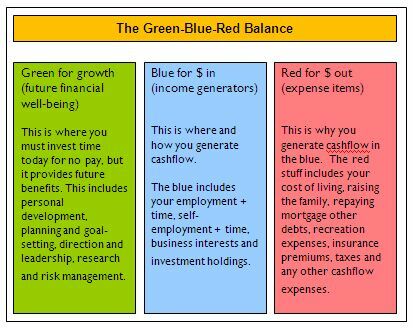 Notice the green in the Green-Blue-Red Balance model is directly aligned to financial leadership tasks. Whereas the blue activities represents the attraction of new funds and the red activities represent the investing and spending of your funds in chosen activities (financing or borrowing, holidays and recreation, food and other living costs).